NASA's Solar Dynamics Observatory. This video showcases highlights from the last five years. Watch the movie to see giant clouds of solar material hurled out into space, the dance of giant loops hovering in the corona, and huge sunspots growing and shrinking on the sun's surface. 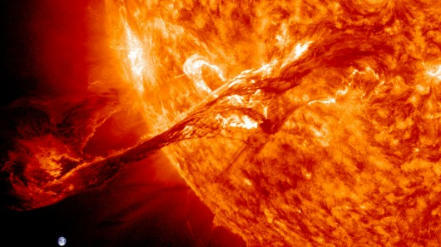 The imagery in this video is an example of the kind of data that SDO provides to scientists. By watching the sun in different wavelengths – and therefore different temperatures – scientists can watch how material courses through the corona, which holds clues to what causes eruptions on the sun, what heats the sun's atmosphere up to 1,000 times hotter than its surface, and why the sun's magnetic fields are constantly on the move. 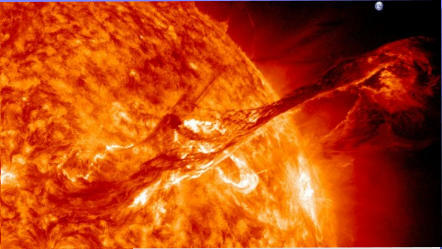 SDO also measures fluctuations in the sun’s extreme ultraviolet output, which provides the majority of energy for heating Earth’s upper atmosphere.